At least one Toronto city councillor believes City Council should reverse that trend, and should begin looking at all options available to ensure sure neither municipal capital nor municipal pension funds can profit from fossil fuel-based investments going forward. New York City mayor Bill de Blasio recently announced that the city will divest its pension funds – worth $189 billion – from fossil fuel reserve owners in the next five years, a move which caught the attention of Layton, who has argued in the past for greater municipal leadership in the fight against climate change. At the time of the announcement, New York City’s five pension funds held roughly $5 billion in the securities of over 190 fossil fuel companies. Unlike NYC’s pension system, the City of Toronto uses the Ontario Municipal Employees Retirement System (OMERS), a province-wide pension fund for municipal employees that operates at arm’s length from the municipalities that fund it. 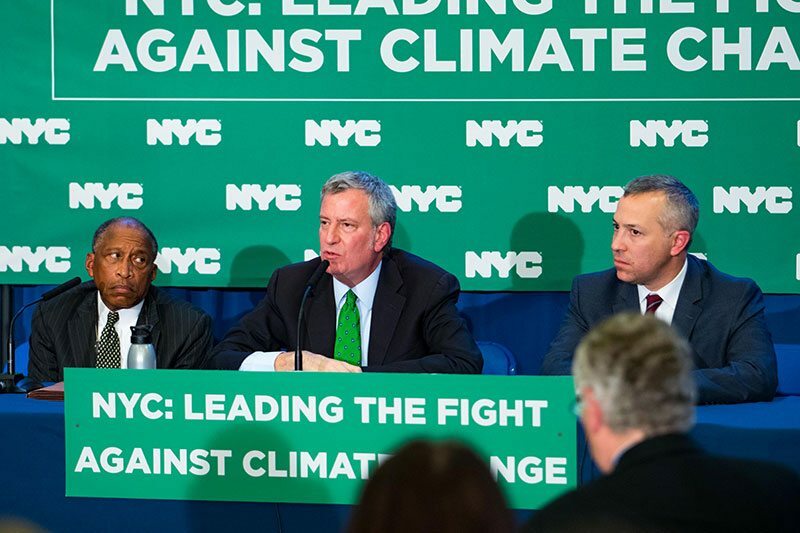 The city is therefore unable to unilaterally divest in the same way that de Blasio has done – to great fanfare among environmental groups. According to the OMERS 2017 Annual Report, the OMERS portfolio had 5.2 percent exposure to the energy industry in 2017 – up from 4.7 percent in 2016. The report does not outline the specific energy industry investments within the portfolio. According to an OMERS webpage that has recently been removed however, three of the private pension fund’s 20 ‘Major Investments’ are fossil fuel companies listed on the Toronto Stock Exchange. These include Enbridge Inc., TransCanada Corporation and Seven Generations Energy, which totaled more than $1.26 billion of its $85 billion in net assets as of December 31, 2016, according to an archived version of the site that was available as recently as January. Toronto has a few legacy pensions it manages, although these will most likely be merged into OMERS in the next year, said Paula Chung, a spokesperson for the city. Although the City of Toronto itself may not have the clear-cut opportunities to divest from fossil fuels as New York City does, Toronto City Council recently approved a new investment policy in December 2017 to align with the latest regulations of the Toronto Investment Board. According to Chung, Toronto’s capital funds – including reserves and reserve funds, sinking funds for debt retirement, and short-term funds for the city’s operation, all totaling some $6 billion – do not currently include fossil fuel investments, due to the decades old regulations set by the province that limited the types of investments the City could make. Consequently, Toronto has traditionally been mostly restricted to investing in government and bank bonds. The establishment of the board therefore represents a very big change for the city, according to Randy LeClair, a senior investment advisor with the City of Toronto. “We’ve gone from a prescribed list of investments that was set down by the province in regulation, saying we can only invest in basically government bonds and some bank bonds with a certain credit rating, to a fairly wide open ‘prudent investor standard,’” said Leclair. City Council has asked that the investment board come back with a report in June 2018, specifying whether or not ESG considerations could or should be implemented in the city’s shorter-term investment decisions going forward. But Layton said he believes City Council made it very clear that incorporating ESG factors into future capital investment policies was the direction they would like to take. Layton has recently been in contact with representatives from Shift, a new Canadian initiative focused on Canadian pension funds and climate change, within the umbrella of Tides Canada. Jordy Gold, Director at Shift, said that although the decision was made early on that the initiative would not be focused on divestment, the young organization aims to support Canadian pension holders and influencers as they engage with their pension funds to prepare for both climate related-risk and opportunities. “We should absolutely be pushing for more low carbon investments, we absolutely need to have more disclosure around pensions to understand what’s going on and to have a conversation, and we need to pay some real attention to the climate-related risks that are involved,” said Gold. Whether or not large institutional investors in Ontario such as OMERS will follow New York City’s example and move to divest from fossil fuel holdings remains to be seen, but “if OMERS were to announce they were divesting from fossil fuels, that would certainly catch people’s attention,” Rubin said.